A pobreza, por exemplo, contém um paradoxo. Na mesma medida que é privação, também é potência. Por óbvio, privação e potência não acontecem ao mesmo tempo. Mas o pobre é aquela força que caminha nesse campo instável, onde pode transitar por todo o espectro de grau entre uma e outra. Porque a pobreza tem uma dimensão afirmativa, inventa novos usos, constrói o máximo do mínimo, a favela do lixo, a poesia das expressões doridas e tensionadas das ruas. Gatos nascem livres e pobres e recusam a ser chamados pelo nome. Qualquer prescrição de imobilidade não serve para quem tem de se mover todos os dias para reinventar o mundo, em cuja crise o pobre vive e se relaciona. Devir pobre ativa a potência insofismável dessa classe inscrita como agente de produção do capitalismo. Com essa forma de pôr o problema, é possível se concentrar antes nas estratégias e táticas de ação, nos agenciamentos do desejo, nas formas de criar e se deslocar, — em tudo que isso que favorece uma fuga reexistente das identidades, e assim favorece a diferença por si mesma — do que ficar idealizando e descrevendo outras identidades possíveis, lutando pelas existentes ou combatendo outras que possam vir a existir, como faria um inventariante dos elementos culturais por aí. Posso irromper dentro de mim, — mesmo que eu me constitua de forças majoritárias e dominantes da cultura estabelecida, — irromper o meu avesso, o meu avesso simétrico, o meu índio e o meu subdesenvolvimento, um intensivo pelo qual tudo o que passa resulta diferente. Essa diferença ameaça o poder constituído. Uma força que vem, acontece, e me arrasta pra outro lugar e outro tempo. Portanto, é preciso recolocar o problema. Preocupar-se em ser pobre ou índio é muito pouco. Faz-se necessário mobilizar os substantivos em verbos, molecularizar os adjetivos em advérbios. O caso não está na transformação de A a B ou de B a A. E sim no diferencial C que faz com que A e B possam coexistir no mesmo plano de composição política. Então é caso do pobre devir índio e o índio devir pobre. E mais. Seguindo a lógica, igualmente sucede um diferencial entre A e A´, e entre B e B´. Ou seja, o pobre devir pobre e o índio devir índio. Se o projeto do novo Brasil consiste em fazer da “Classe C” o modelo de cidadão, trabalhador e consumidor, esta figura antropológica pode devir pobre-potência. O trabalhador recusa o trabalho, o consumidor consome o consumo e o cidadão se revolta. De maneira simétrica, o índio devém índio ao impregnar as forças que o constrangem na maior comunidade de todos os tempos: o mercado capitalista global. Menos para ser reconhecido como indígena do que para indianizar o poder. Institui outras formas de medir, se relacionar e escapar dos aparelhos de captura. Contra Belo Monte, o Xingu em São Paulo. Devo parte do conteúdo deste artigo à palestra proferida por Cléber Lambert no seminário de anteontem à Casa de Rui Barbosa, co-organizado pela Universidade Nômade, bem como ao encontro produtivo entre dois pensadores de primeiro time do Brasil contemporâneo, Eduardo Viveiros de Castro e Giuseppe Cocco. Mysterious fossils of what may be a previously unknown human species were uncovered in caves in China. The hominins lived some time between 11,500 and 14,500 years ago, meaning they would have shared the landscape with modern humans when China’s earliest farmer were first appearing. Discovered at what is called Red Deer Cave in southwest China, the hominins have been dubbed the Red Deer Cave People. A skull of the possibly new hominin, shown here. CREDIT: Darren Curnoe. The controversial extinct human lineage known as “hobbits” gained a face this year, one of many projects that shed light in 2012 on the history of modern humans and their relatives. Other discoveries include the earliest known controlled use of fire and the possibility that Neanderthals or other extinct human lineages once sailed to the Mediterranean. Here’s a look at what we learned about ourselves through our ancestors this year. A trove of discoveries this year revealed a host of other extinct relatives of modern humans. For instance, researchers unearthed 3.4-million-year-old fossils of a hitherto unknown species that lived about the same time and place as Australopithecus afarensis, a leading candidate for the ancestor of the human lineage. In addition, fossils between 1.78 million and 1.95 million years old discovered in 2007 and 2009 in northern Kenya suggest that at least two extinct human species lived alongside Homo erectus, a direct ancestor of our species. Moreover, fossils only between 11,500 and 14,500 years old hint that a previously unknown type of human called the “Red Deer Cave People” once lived in China. DNA extracted from a recently discovered extinct human lineage known as the Denisovans — close relatives of Neanderthals — also revealed new details about this group, which once interbred with modern humans. The Denisovan genome that was sequenced belonged to a little girl with dark skin, brown hair and brown eyes, and displayed about 100,000 recent changes in our genome that occurred after the split from the Denisovans. A number of these changes influenced genes linked with brain function and nervous system development, leading to speculation that we may think differently from the Denisovans. Genetic analysis also suggested the only modern humans whose ancestors did not interbreed with Neanderthals were apparently sub-Saharan Africans. These findings are just one tidbit regarding the closest extinct relatives of modern humans that was revealed this year. Scientists also found that the unusually powerful right arms of Neanderthals might not have been due to a spear-hunting life as was previously suggested, but rather one often spent scraping animal skins for clothes and shelters. Archaeologists also suggested that Neanderthals and other extinct human lineages might have been ancient mariners, venturing to the Mediterranean Islands millennia before researchers think modern humans arrived at the isles. Ancient artifacts revealed this year also have shown how tool use has helped humanity reshape the world — and perhaps inadvertently reshape humanity as well. For instance, ash and charred bone, the earliest known evidence of controlled use of fire, reveal that human ancestors may have used fire 1 million years ago, 300,000 years earlier than thought, suggesting that human ancestors as early as Homo erectus may have begun using fire as part of their way of life. Controlled fires and cooked meat may have influenced human brain evolution, allowing our ancestors to evolve to have larger, more calorie-hungry brains and bodies. Discoveries involving ancient weapons also revealed that humans learned to make and use these tools far earlier than scientists thought. For instance, what may be ancient stone arrowheads or lethal tools for hurling spearssuggest humans innovated relatively advanced weapons about 70,000 years ago, while a University of Toronto-led team of anthropologists found evidence that humans in South Africa used stone-tipped weapons for hunting 500,000 years ago, which is 200,000 years earlier than previously suggested. Even the seemingly innocuous discovery this year of the first direct signs of cheesemakingfrom 7,500-year-old potsherds from Poland might help reveal how animal milk dramatically shaped the genetics of Europe. Most of the world, including the ancestors of modern Europeans, is lactose intolerant, unable to digest the milk sugar lactose as adults. However, while cheese is a dairy product, it is relatively low in lactose. Transforming milk into a product such as cheese that is friendlier to lactose-intolerant people might have helped promote the development of dairying among the first farmers of Europe. The presence of dairying over many generations may then, in turn, have set the stage for the evolution of lactase tolerance in Europe. As such, while cheese might just seem to be a topping on pizza or a companion to wine, it might have changed Western digestive capabilities. Other clues regarding the diet of ancient relatives also emerged. For example, 2-million-year-old fossils suggest humans’ immediate ancestor may have lived off a woodland dietof leaves, fruits and bark, instead of a menu based on the open savanna, as other extinct relatives of humanity did. In addition, fragments of a 1.5-million-year-old skull from a child recently found in Tanzania suggest that later members of the human lineage weren’t just occasional carnivores but regular meat eaters, findings that help build the case that meat-eating helped the human lineage evolve large brains. When it comes to the future of humanity, research this year added to accumulating evidence that natural forces of evolution continue to shape humanity. Church records of nearly 6,000 Finns born between 1760 and 1849 showed that despite humans radically altering their environments with behavior such as farming, human patterns of survival and reproduction were comparable with those of other species. One researcher at Stanford University has even suggested that humans are getting dumber over time, having lost the evolutionary pressure to be smart once we started living in densely populated settlements several millennia ago. However, other scientists dispute this notion, pointing at geniuses such as Stephen Hawking, and suggest that rather than losing our intelligence, people have diversified, resulting in a number of different types of smarts today. O Ministério da Saúde vai tornar compulsória a notificação de todas as pessoas infectadas com o vírus HIV, mesmo as que não desenvolveram a doença. A portaria ministerial que trata da obrigatoriedade de aviso de todos os casos de detecção do vírus da aids no País deve ser publicada em janeiro. Atualmente, médicos e laboratórios informam ao Ministério da Saúde apenas os casos de pacientes que possuem o HIV e tenham, necessariamente, manifestado a doença. Os dados serão mantidos em sigilo. Somente as informações de perfil (sem a identificação do nome) poderão ser divulgadas para fins estatísticos. Hoje, o governo monitora os soropositivos sem aids de maneira indireta. As informações disponíveis são de pessoas que fizeram a contagem de células de defesa nos serviços públicos ou estão cadastradas para receber antirretrovirais pelo Sistema Único de Saúde (SUS). O novo banco de dados será usado para planejamento de políticas públicas de prevenção e tratamento da aids. “Para a saúde pública é extremamente importante, porque nós vamos poder saber realmente quantas pessoas estão infectadas e o tipo de serviços que vamos precisar”, explica Dirceu Grego, diretor do Departamento de DST, Aids e Hepatites Virais do Ministério da Saúde. A mudança ocorre quatro meses após o governo anunciar a ampliação do acesso ao tratamento com medicação antirretroviral oferecido pelo SUS. A prescrição passou a ser feita em estágios menos avançados da aids. Desde então, casais com um dos parceiros soropositivo passaram a ter acesso à terapia em qualquer estágio da doença. O ministério também recomendou que a droga seja ministrada de forma mais precoce para quem não têm sintomas de aids, mas possui o vírus no organismo – uma tendência na abordagem da doença, reforçada na última Conferência Internacional de Aids, realizada em julho deste ano nos Estados Unidos. À época, o ministério calculou que o número de brasileiros com HIV fazendo uso dos antirretrovirais aumentaria em 35 mil. Atualmente, são cerca de 220 mil pacientes com aids. Outras 135 mil pessoas, estima o governo, têm o HIV, mas não sabem. Elas estão no foco da mudança na obrigatoriedade de notificação, porque não foram ainda diagnosticadas. Segundo Grego, essas pessoas devem ser incorporadas ao tratamento. Assim como ocorre quando os pacientes são diagnosticados com aids, caberá aos médicos e laboratórios avisar ao ministério sobre a descoberta de pessoas infectadas – os soropositivos. As informações são do jornal O Estado de S.Paulo. The researchers — including Gail Ashley, professor of earth and planetary sciences, Rutgers University — examined lake sediments from Olduvai Gorge in northern Tanzania. They removed the organic matter that had either washed or was blown into the lake from the surrounding vegetation, microbes and other organisms 2 million years ago from the sediments. In particular, they looked at biomarkers — fossil molecules from ancient organisms — from the waxy coating on plant leaves. “We looked at leaf waxes because they’re tough, they survive well in the sediment,” said Freeman. “We find complementary forcing mechanisms: one is the way Earth orbits, and the other is variation in ocean temperatures surrounding Africa,” Freeman said. The researchers recently published their results in the Proceedings of the National Academy of Sciences along with another paper in the same issue that builds on these findings. The second paper shows that rainfall was greater when there were trees around and less when there was a grassland. “The research points to the importance of water in an arid landscape like Africa,” said Magill. “The plants are so intimately tied to the water that if you have water shortages, they usually lead to food insecurity. Nicolle Rager Fuller / NSF. The first specimen of Paranthropus boisei, also called Nutcracker Man, was reported by Mary and Louis Leakey in 1959 from a site in Olduvai Gorge, Tanzania. At Olduvai Gorge, where excavations helped to confirm Africa was the cradle of humanity, scientists now find the landscape once fluctuated rapidly, likely guiding early human evolution. These findings suggest that key mental developments within the human lineage may have been linked with a highly variable environment, researchers added. Olduvai Gorge is a ravine cut into the eastern margin of the Serengeti Plain in northern Tanzania that holds fossils of hominins — members of the human lineage. Excavations at Olduvai Gorge by Louis and Mary Leakey in the mid-1950s helped to establish the African origin of humanity. To learn more about the roots of humanity, scientists analyzed samples of leaf waxes preserved in lake sediments at Olduvai Gorge, identifying which plants dominated the local environment around 2 million years ago. This was about when Homo erectus, a direct ancestor of modern humans who used relatively advanced stone tools, appeared. “We looked at leaf waxes, because they’re tough, they survive well in the sediment,” researcher Katherine Freeman, a biogeochemist at Pennsylvania State University, said in a statement. The researchers discovered that Olduvai Gorge abruptly and routinely fluctuated between dry grasslands and damp forests about five or six times during a period of 200,000 years. The investigators also constructed a highly detailed record of water history in Olduvai Gorge by analyzing hydrogen isotope ratios in plant waxes and other compounds in nearby lake sediments. These findings support the carbon isotope data, suggesting the region experienced fluctuations in aridity, with dry periods dominated by grasslands and wet periods characterized by expanses of woody cover. Earth’s orbit around the sun can vary over time in a number of ways — for instance,Earth’s orbit around the sun can grow more or less circular over time, and Earth’s axis of spin relative to the sun’s equatorial plane can also tilt back and forth. This alters the amount of sunlight Earth receives, energy that drives Earth’s atmosphere. The team also found links between changes at Olduvai Gorge and sea-surface temperatures in the tropics. “We find complementary forcing mechanisms — one is the way Earth orbits, and the other is variation in ocean temperatures surrounding Africa,” Freeman said. These findings now shed light on the environmental shifts the ancestors of modern humans might have had to adapt to in order to survive and thrive. This variability in the environment coincided with a key period in human evolution, “when the genus Homo was first established and when there was first evidence of tool use,” Magill said. The researchers now hope to examine changes at Olduvai Gorge not just across time but space, which could help shed light on aspects of early human evolution such as foraging patterns. Magill, Freeman and their colleague Gail Ashley detailed their findings online Dec. 24 in two papers in the Proceedings of the National Academy of Sciences. A Assembleia Legislativa de Mato Grosso aprovou nesta quarta-feira (19/12) projeto de lei que cria o Sistema Estadual de REDD+ em Mato Grosso. O projeto, de autoria do poder executivo, segue agora para a sanção do governador Silval Barbosa (PMDB) e não deverá sofrer alterações no texto. O sistema tem como objetivo promover a redução das emissões dos gases de efeito estufa com origem no desmatamento e degradação florestal e também estimular o manejo florestal sustentável, além do aumento de estoques de carbono no estado. “A aprovação desta lei representa um marco regulatório para o estado, pois vamos compartilhar os benefícios da conservação ambiental”, declarou o secretário estadual de Meio Ambiente Vicente Falcão. “É uma conquista do governo, mas também da sociedade civil que durante dois anos discutiu uma proposta que veio na maturidade certa”, complementou. O texto aprovado na Assembleia prevê ainda a participação efetiva dos diferentes grupos sociais envolvidos ou afetados pelas ações de REDD. Ou seja, os projetos e programas de desmatamento evitado em áreas de assentamentos ou terras indígenas, por exemplo, terão que atender as demandas dessas comunidades, além de prever um mecanismo de distribuição justa de benefícios. Para o secretário a implantação de um sistema de REDD+ consolida as políticas ambientais e significa um passo importante para cumprir a meta de reduzir o desmatamento no estado em 89% até o ano de 2020. “Agora há uma nova leitura, pois além do comando e controle vamos ter instrumentos de incentivo para inibir o desmatamento”, concluiu. Laurent Micol, coordenador executivo do Instituto Centro de Vida – ICV, entidade que coordena o GT REDD no Fórum Mato-grossense de Mudanças Climáticas, explica que com a aprovação da lei, Mato Grosso assume um protagonismo nacional em relação a instrumentos de desmatamento evitado. “Os futuros projetos e programas de redução de desmatamento em andamento poderão se enquadrar na lei assim como os futuros projetos terão que assegurar as questões sociais e ambientais previstas na lei”, explicou. “Há também uma maior segurança para os investidores e doadores para estes projetos e programas”, completou. Micol usou como exemplo a recente doação do banco alemão KFW que repassou 8 milhões de reais ao governo do Acre, o primeiro estado na Amazônia a ter uma legislação com esta finalidade, como pagamento por serviços ambientais. A discussão da proposta da lei começou com a instituição do Grupo de Trabalho REDD, em março de 2009, no âmbito do Fórum Mato-grossense de Mudanças Climáticas. O grupo trabalhou durante dois anos na elaboração da proposta, que foi debatida em consultas públicas e recebeu propostas de modificações pela internet. Ao todo foram 171 proposições que foram analisadas até a versão final da minuta ser validada pelo Fórum. Assim que sancionada a lei, o governo deverá instituir o Conselho Gestor do Sistema Estadual de REDD+, que terá função deliberativa. O conselho terá 12 representantes e será paritário entre governo estadual e federal com a sociedade civil. Enquanto isso, o GT REDD está trabalhando na proposta de um programa setorial para o manejo florestal para ser apresentado a Secretaria de Estado de Meio Ambiente (Sema). O GT REDD MT conta com 78 membros, incluindo a Sema e outras secretarias estaduais, a Procuradoria do Estado, a Assembleia Legislativa, representações de organizações dos setores agropecuário, florestal, organizações da sociedade civil e movimentos sociais, a Ordem dos Advogados do Brasil e a Universidade Federal de Mato Grosso. O ICV foi eleito para coordenar e facilitar os trabalhos do grupo. REDD+ é a sigla em inglês para Redução de Emissões por Desmatamento e Degradação Florestal, incluindo a conservação e ao manejo das florestas e o aumento dos estoques de carbono. GUEST: Pamela Palmater, chair in indigenous governance at Ryerson University, spokeswoman for the Idle No More movement and a member of the Eel River Bar First Nation. Dec. 21, 2012 — Forget solid, liquid, and gas: there are in fact more than 500 phases of matter. In a major paper in a recent issue of Science, Perimeter Faculty member Xiao-Gang Wen reveals a modern reclassification of all of them. Condensed matter physics — the branch of physics responsible for discovering and describing most of these phases — has traditionally classified phases by the way their fundamental building blocks — usually atoms — are arranged. The key is something called symmetry. To understand symmetry, imagine flying through liquid water in an impossibly tiny ship: the atoms would swirl randomly around you and every direction — whether up, down, or sideways — would be the same. The technical term for this is “symmetry” — and liquids are highly symmetric. Crystal ice, another phase of water, is less symmetric. If you flew through ice in the same way, you would see the straight rows of crystalline structures passing as regularly as the girders of an unfinished skyscraper. Certain angles would give you different views. Certain paths would be blocked, others wide open. Ice has many symmetries — every “floor” and every “room” would look the same, for instance — but physicists would say that the high symmetry of liquid water is broken. Beginning in the 1980s, condensed matter researchers, including Xiao-Gang Wen — now a faculty member at Perimeter Institute — investigated new quantum systems where numerous ground states existed with the same symmetry. Wen pointed out that those new states contain a new kind of order: topological order. Topological order is a quantum mechanical phenomenon: it is not related to the symmetry of the ground state, but instead to the global properties of the ground state’s wave function. Therefore, it transcends the Landau paradigm, which is based on classical physics concepts. Topological order is a more general understanding of quantum phases and the transitions between them. In the new framework, the phases of matter were described not by the patterns of symmetry in the ground state, but by the patterns of a decidedly quantum property — entanglement. When two particles are entangled, certain measurements performed on one of them immediately affect the other, no matter how far apart the particles are. The patterns of such quantum effects, unlike the patterns of the atomic positions, could not be described by their symmetries. If you were to describe a city as a topologically ordered state from the cockpit of your impossibly tiny ship, you’d no longer be describing the girders and buildings of the crystals you passed, but rather invisible connections between them — rather like describing a city based on the information flow in its telephone system. This more general description of matter developed by Wen and collaborators was powerful — but there were still a few phases that didn’t fit. Specifically, there were a set of short-range entangled phases that did not break the symmetry, the so-called symmetry-protected topological phases. Examples of symmetry-protected phases include some topological superconductors and topological insulators, which are of widespread immediate interest because they show promise for use in the coming first generation of quantum electronics. In the paper featured in Science, Wen and collaborators reveal a new system which can, at last, successfully classify these symmetry-protected phases. Using modern mathematics — specifically group cohomology theory and group super-cohomology theory — the researchers have constructed and classified the symmetry-protected phases in any number of dimensions and for any symmetries. Their new classification system will provide insight about these quantum phases of matter, which may in turn increase our ability to design states of matter for use in superconductors or quantum computers. This paper is a revealing look at the intricate and fascinating world of quantum entanglement, and an important step toward a modern reclassification of all phases of matter. Massachusetts, home to America’s best schools and best-educated workforce, has seen income inequality soar. Why? The poor are losing an academic arms race with the rich. Americans came to believe over time that education could ensure that all children of any class had a shot at success. And if any state should be able to make that belief a reality, it was Massachusetts. The Bay State is home to America’s oldest school, Boston Latin, and its oldest college, Harvard. It was the first state to appoint an education secretary, Horace Mann, who penned the “equalizer” motto in 1848. Today, Massachusetts has the country’s greatest concentration of elite private colleges, and its students place first in nationwide Department of Education rankings. Yet over the past 20 years, America’s best-educated state also has experienced the country’s second-biggest increase in income inequality, according to a Reuters analysis of U.S. Census data. As the gap between rich and poor widens in the world’s richest nation, America’s best-educated state is among those leading the way. Between 1989 and 2011, the average income of the state’s top fifth of households jumped 17 percent. 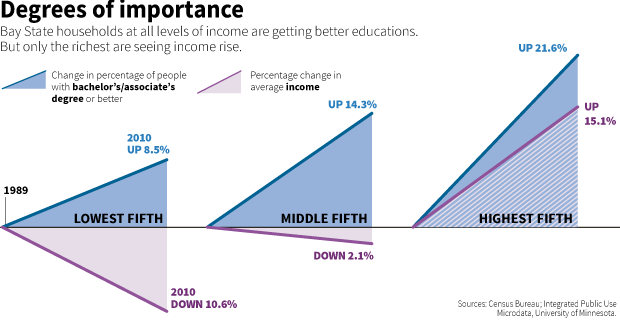 The middle fifth’s income dropped 2 percent, and the bottom fifth’s fell 9 percent. Massachusetts now has one of the widest chasms between rich and poor in America: It is the seventh-most unequal of the 50 states, according to a Reuters ranking of income inequality. Two decades ago, it placed 23rd. If the great equalizer’s ability to equalize America is dwindling, it’s not because education is growing less important in the modern economy. Paradoxically, it’s precisely because schooling is now even more important. One force behind rising inequality, in both America and other advanced economies, is well-known. The decline of manufacturing and the replacement of clerks and secretaries with software mean there are fewer high-paying jobs for low-skilled workers. The good jobs that do exist increasingly require higher education: Since the recession started in the U.S. in 2007, the number of jobs needing a college degree has risen by 2.2 million, according to a recent Georgetown University study. The number of jobs for mere high-school graduates fell by 5.8 million. FALLING BEHIND THE RICHJust to stay even, poorer Americans need to obtain better credentials. But that points to another rich-poor divide in the United States. Educators call it the scholastic “achievement gap.” It has been around forever, but it’s getting wider. Lower-class children are getting better educations than before. But richer kids are outpacing their gains, which in turn is stoking the widening income gap. Across the country, a Stanford University study found last year, the achievement gap between rich and poor students on standardized tests is 30 to 40 percent wider than it was a quarter-century ago. Because excellent students are more likely to grow rich, the authors argued, income inequality risks becoming more entrenched. It’s an academic arms race, and it can be seen in the sharply contrasting fortunes of Weston, a booming Boston suburb, and the blue-collar community of Gardner, where a 20-foot-tall chair sits on Elm Street as a monument to the town’s past as a furniture-manufacturing hub. The percentage of Gardner children bound for four-year colleges has held steady at about half in the past decade, and median incomes have tumbled as furniture makers headed south or overseas. Gardner High School graduate Curtis Dorval dropped out of the University of Massachusetts this year after his father, a Walmart worker, ran short of money. He’s working at a Walmart now, too, and then heading off to the military. In Weston, hedge-fund managers are tearing down modest homes to build mansions. Per-capita incomes have leaped 161 percent in the past two decades, and the high school is sending 96 percent of its graduates to universities. This correlation between educational attainment and financial fortune is clear statewide. In the bottom fifth of Massachusetts households, the average income dropped 9 percent in the past 20 years to $12,000. They fared worse despite a sizable gain in educational attainment: The share of people 25 and older in the group with a bachelor’s degree rose to 18.5 percent from 11 percent. The same thing happened to the middle fifth. Their average income slipped 2 percent to $63,000. The share of adults with a bachelor’s rose to 43 percent from 29 percent. But the top fifth saw their average income leap 17 percent, to $217,000, as their education levels soared far higher. Three-quarters had a bachelor’s, up from half. Fully 50 percent had a post-graduate degree, up from a quarter. Some Massachusetts officials say they fear a vicious cycle is taking hold, in which income inequality and educational inequality feed off each other. Democrats and Republicans agree that the increased disparity is a threat to economic mobility in the state. But as in much of the rest of the United States, they disagree over what to do about it. Democrats argue the solution is more – and earlier – schooling. Republicans believe traditional public schools are part of the problem. The education gap is just one factor behind growing inequality. The U.S. economy has been so weak that large numbers of graduates are underemployed: In 2010, according to Andy Sum, director of the Center for Labor Market Studies at Northeastern University in Boston, only 59 percent of Massachusetts adults with a bachelor’s degree were in jobs that actually required one. Long-term changes in marriage patterns matter, too, because they are stoking the educational-attainment gap that in turn feeds the income chasm. People are increasingly more likely to marry their educational equal, Sum’s research finds, creating well-paid two-income couples at the top. At the bottom fifth, the number of single-parent families has risen 15 percent since 1990. Those parents have lower incomes and less time to devote to their children’s schooling. In a pattern echoed nationwide, 70 percent of Massachusetts families with children in the bottom fifth are headed by a single parent – compared with 7 percent in the top fifth. A brainier workforce alone isn’t sufficient to drive growth, though. Even as education levels in the Bay State have risen lately, faster growth hasn’t followed. Between 2000 and 2010, Sum found, Massachusetts ranked just 37th in job creation. In fact, none of the 10 states with the top students placed in the top 10 on payroll growth. “The best educated states were overwhelmingly mediocre in job creation,” he wrote in a study last year. He urges states to complement education with such steps as tax credits, infrastructure spending and on-the-job training. Seventy miles northwest of Boston, Gardner once touted itself as the “chair-making capital of the world.” The factories employed thousands of workers who supported large families on single incomes. The first workplace time-recorder was invented here, too; as a result of its adoption, “punching the clock” became part of the vernacular. Today, the factories have gone south or closed. Gardner still calls itself the furniture capital of New England but because of its outlet stores, not its factories. The biggest employers are a hospital and a community college. Retail jobs at Walmart and other chains have replaced better-paying factory work. Between 1989 and 2009, the town’s per capita income slipped 19 percent to $18,000. A town of some 20,000 people, Gardner has roughly twice the population of wealthy Weston, but spends just 60 percent as much on education. The town’s high school has had six principals in the past eight years. Even kids who excel at Gardner High School increasingly face financial hurdles after they graduate, say teachers and students. Mayor Mark Hawke said cost routinely prices high-achieving students out of elite private colleges. “It happens every day,” he said. David Dorval, 47, was laid off in 2009 after working at an area hospital registering patients for 16 years. 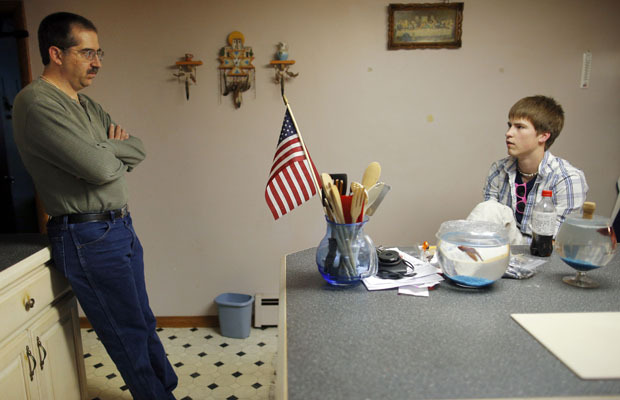 Dorval, who has an associate’s degree, struggled to find work, and he and his wife divorced. Today he takes home $1,000 a month at Walmart in Gardner and pays half of his earnings to his ex-wife in child support. He goes to his 79-year-old mother’s house for lunch each day. His son, Curtis Dorval, works at Walmart as well. When he was a senior at Gardner High School, Curtis was class president. He was accepted by Northeastern University, a private school in Boston. But Northeastern cost $50,000 a year, which Curtis, then 17, felt he couldn’t afford. Instead, he enrolled last year at the state-run University of Massachusetts Amherst, studying mechanical engineering. With the help of a scholarship for graduating in the top quarter of his class, Curtis paid $10,200 a year. He got some help from his father, who had saved up $10,000 in stocks and bonds from his days in the hospital job. This summer, that money ran out and Curtis left UMass to enlist in the Air Force. He will serve as an airman – and hopes to use military benefits to pay for parttime university classes. “The main reason was I needed a way to pay for college,” he said. That is the flip side of New England’s excellent universities: They are the most expensive in the country, according to a study by the College Board. A four-year education at a public or private university costs nearly one-fourth more than the national average. Sticker shock is forcing those who do stay in college to pass up elite private schools for cheaper state ones. That’s also happening in the middle-class town of Leominster, a former plastics-manufacturing center 15 miles east of Gardner. Among last year’s top students was Eric Marcoux, co-leader of the robotics team and member of the National Honor Society. He was accepted to Worcester Polytechnic Institute, a top private engineering university. WPI offered him a $20,000 annual scholarship – but he and his family still faced taking on roughly $30,000 a year in debt. Marcoux chose the University of Massachusetts Lowell, where he’ll have to borrow only half as much. 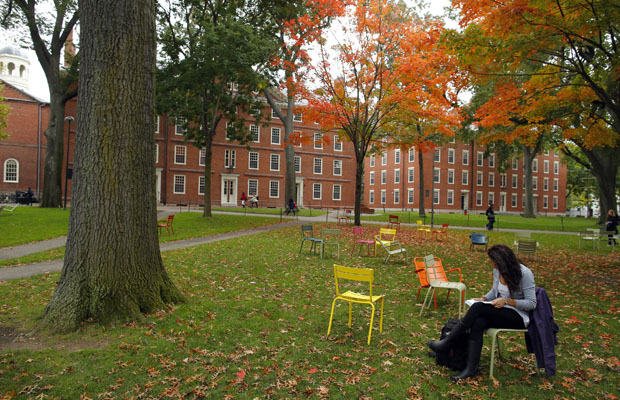 Trading down can carry a stiff cost: A Harvard study published this year found that students who go to Massachusetts state colleges are less likely to graduate than those who attend Massachusetts private colleges. The state has tried to help poorer kids. In the early 1990s, Massachusetts sharply increased state funding of local elementary and secondary schools and mandated comprehensive testing. The overhaul was designed to improve student performance and eradicate the achievement gap. Twenty years later, Massachusetts spends $4.8 billion a year on its public schools, up 83 percent from 1990. Children from lower income families have improved their scores on tests, but their results still lag, as a look at results from the Scholastic Aptitude Tests makes clear. In the state’s five wealthiest school districts, students had average scores ranging from 594 to 621 on the 800-point college-admissions test in 2009-2010. In the five poorest districts for which data are available, the SAT scores averaged from 403 to 469. What he proposes is sweeping change. Income depends on educational achievement, and the single best predictor of a child’s likelihood of academic success remains in turn the socio-economic status of his or her mother, said Reville. The solution to erasing the achievement gap involves, in essence, providing low-income students with the advantages their wealthier peers enjoy: pre-school at the age of three, tutors, summer camps, and after-school activities like sports and music lessons. Schools could contract with outside organizations to provide those activities, or lengthen their school day or school year by one-third. Such talk makes Massachusetts Republicans blanch. They say they care about income disparities that harm people’s ability to move up the income ladder. Americans are now less likely to move to a higher economic class in their lifetime than Western Europeans or Canadians, according to a number of recent studies. Republicans argue that the problem is not resources in the public schools: Massachusetts already ranks No. 8 in the amount of money states spend per student, according to the Census Bureau. Instead of spending more, Stergios said, give parents greater choice over which schools their children attend. Expand the use of charter schools, financed by the public but managed independently. Make cities strictly follow the course of study set out by the state. Increase the accountability of teachers by linking pay to student test scores. Adding to the complexity of addressing the income and educational gaps is a widening geographical divide in the state. In Massachusetts, some 230,000 people were unemployed in October, Conference Board data show, and roughly 140,000 unfilled jobs were advertised online. Skilled professions, including software engineers and web developers, topped the list. Nearly seven out of 10 vacancies were in the Boston area. Harvard economist Ed Glaeser calls this the new reality of a knowledge-based global economy. More than ever, innovation, growth and opportunity are clustered in large cities such as Boston. Let decaying factory towns become ghost towns. Instead of building better transportation links, Glaeser believes their inhabitants should be encouraged to move to the closest economic hub. Weston, where Glaeser himself lives, is such a cluster. But it isn’t for everyone. Its house prices and real estate taxes put it out of reach for most Massachusetts residents, which points up a conundrum. As those who can afford to do so head for the clusters, inequality grows. Across the state, communities are becoming more homogenous by income group, said Ben Forman, research director at think tank MassInc. The Boston suburbs where Weston is located are home to the most-educated workforce in the nation’s best-educated state, according to the Boston Federal Reserve. A Reuters analysis of Census and American Community Survey data found that two-thirds of working-age adults in Weston and surrounding towns had at least a bachelor’s degree in 2010. That’s more than double the national average of 28 percent. Just 23 percent of their peers in Gardner and its neighbors had a bachelor’s or better. As earnings fell in Gardner they soared in Weston. In 1990, Weston residents made 3.5 times more than Gardnerites. By 2009, it was 12 to 1. On a summer Tuesday afternoon, a man was reading a copy of “Horseback Riding for Dummies” outside Bruegger’s Bagels, the sole fast-food chain that Weston has allowed to open as it tries, with mixed success, to preserve its historic character. One hedge-fund manager built a 22-room mansion with a basketball court, pool and 10-car garage. Another tore down two homes to build a private equestrian center for his wife and daughter with an indoor riding ring. One area where development is warmly welcome is education. This fall, the town opened a new $13 million science wing for Weston High School that includes nine state-of-the art labs and a multimedia conference center. Weston High is one of the finest public schools in the country. In 2011, 96 percent of its graduates planned to go on to four-year degree programs. In Gardner, only about half did. Nationally, a 2011 University of Michigan study found that the gap in college-completion rates between rich and poor students has grown by about half since the late 1980s. Those differentials have a long-term impact. An American with a bachelor’s degree earns on average about $1 million more over a lifetime than one with just some college, according to recent studies. Another advantage Weston kids have is their involved and demanding parents. Gardner High has no parent-teacher organization. In Weston, parents raised $300,000 last year for additional after-school activities in the public schools. Top scientists living in Weston help with school science fairs. Parental involvement is so intense that three parents sit on the interview panel for every prospective new teacher. Stay-at-home Weston mothers attend meetings of student-body leaders and help students organize events. They’re known as “Grade Moms”. Tanner Skenderian, president of this year’s Weston High graduating class, joked in a speech about her town’s hyper-competitive students. “Welcome to Weston, where third graders take AP Physics, middle-school students sleep for 42 minutes a night, and the most competitive race run by the 2012 boys state champion track team was the race to get the cookies in the cafeteria,” she said. Competition in high school was fierce. In one advanced placement physics class, she said, six of the 12 students were the children of professors at MIT, America’s premier science university. But Tanner thrived there. She also found school to be a source of support after her father died while she was in middle school. This fall, she headed to Harvard, after spending the summer interning at the governor’s office. Given the job market, she said she may apply to business or law school after graduating. Weston, in short, gave her an education that raises her odds of joining her mother – who owns a marketing and event-planning company – at the top of America’s economic ladder. Edited by Michael Williams and Janet Roberts. See more at our Income Inequality homepage. Dec. 18, 2012 — Rates of serious mental illness among university students are drastically rising, and universities are struggling with how to respond to students who show symptoms. Traumatic situations such as academics, financial problems, family problems, intimate and other relationship issues, and career related issues are leaving students overwhelmed, exhausted, sad, lonely, hopeless and depressed. Volume 60, Issue 1, 2012 of the Journal of American College Health includes publication of the first ever feasibility study on Psychiatric Advance Directives (PADs) for college students. PADs allow students who are living with serious mental illnesses to plan ahead with a support person, creating and documenting an intervention strategy to be used in the event of a psychiatric crisis. The study entitled “University Students’ Views on the Utility of Psychiatric Advance Directives” was conducted by Anna M. Scheyett, PhD and Adrienne Rooks, MSW. The researchers found that students perceived PADs as beneficial. Dec. 19, 2012 — Over the last half decade, it has become increasingly clear that the normal gastrointestinal (GI) bacteria play a variety of very important roles in the biology of human and animals. Now Vic Norris of the University of Rouen, France, and coauthors propose yet another role for GI bacteria: that they exert some control over their hosts’ appetites. Their review was published online ahead of print in the Journal of Bacteriology. “The gut microbiota respond both to both the nutrients consumed by their hosts and to the state of their hosts as signaled by various hormones,” write Norris et al. That communication presumably goes both ways: they also generate compounds that are used for signaling within the human system, “including neurotransmitters such as GABA, amino acids such as tyrosine and tryptophan — which can be converted into the mood-determining molecules, dopamine and serotonin” — and much else, says Norris. Furthermore, it is becoming increasingly clear that gut bacteria may play a role in diseases such as cancer, metabolic syndrome, and thyroid disease, through their influence on host signaling pathways. They may even influence mood disorders, according to recent, pioneering studies, via actions on dopamine and peptides involved in appetite. The gut bacterium,Campilobacter jejuni, has been implicated in the induction of anxiety in mice, says Norris. Over at BBC Future, computer scientist Martin Angler has put together a provocative piece about humanity’s collision course with cybernetic technologies. Today, says Angler, we’re using neural interface devices and other assistive technologies to help the disabled. But in short order we’ll be able to radically enhance human capacites — prompting him to wonder about the extent to which we might cyborgize our brains. Yet it’s still a far cry from the visions of man fused with machine, or cyborgs, that grace computer games or sci-fi. The dream is to create the type of brain augmentations we see in fiction that provide cyborgs with advantages or superhuman powers. But the ones being made in the lab only aim to restore lost functionality – whether it’s brain implants that restore limb control, or cochlear implants for hearing. 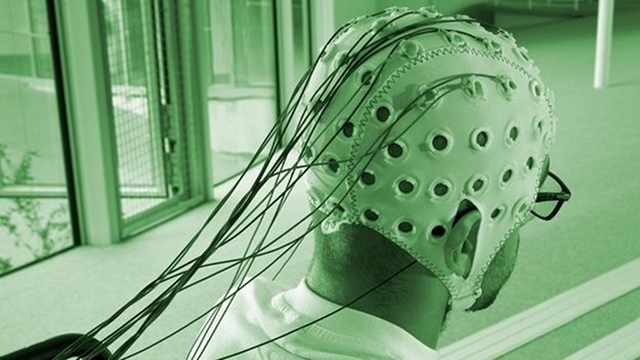 Creating implants that improve cognitive capabilities, such as an enhanced vision “gadget” that can be taken from a shelf and plugged into our brain, or implants that can restore or enhance brain function is understandably a much tougher task. But some research groups are being to make some inroads. For instance, neuroscientists Matti Mintz from Tel Aviv University and Paul Verschure from Universitat Pompeu Fabra in Barcelona, Spain, are trying to develop an implantable chip that can restore lost movement through the ability to learn new motor functions, rather than regaining limb control. Verschure’s team has developed a mathematical model that mimics the flow of signals in the cerebellum, the region of the brain that plays an important role in movement control. The researchers programmed this model onto a circuit and connected it with electrodes to a rat’s brain. If they tried to teach the rat a conditioned motor reflex – to blink its eye when it sensed an air puff – while its cerebellum was “switched off” by being anaesthetised, it couldn’t respond. But when the team switched the chip on, this recorded the signal from the air puff, processed it, and sent electrical impulses to the rat’s motor neurons. The rat blinked, and the effect lasted even after it woke up. As margens são um limite. Até onde o Dilúvio vai, até onde ele pode ir. Balizado pelo concreto humano, o arroio que corta a capital faz parte da rotina da cidade. Em suas margens, estão os congestionamentos e a ansiedade de Porto Alegre. Nas suas beiradas, está, na hora do rush, o stress de querer chegar rápido ao outro lado da cidade e não conseguir a velocidade pretendida. A poluição que corre dentro do Dilúvio também passa nos seus limiares, os quais são contaminados pela exaustão da sociedade perante sua rotina. As margens do Dilúvio transbordam o vazio de nossa civilização que corre apressada sem nem saber o motivo. Que deixa à sua margem aqueles que não têm o capital e as oportunidades iguais, aqueles que não têm o carro, aqueles que não têm a casa. Esses ficam às margens. As bordas também refletem as novas tendências. O desejo da ciclovia, do transporte limpo. Elas falam de um novo caminho que a cidade “quer” abrir. Um caminho para o sustentável. Mas a sustentabilidade não caminha junto da miséria e da desigualdade e ela não é parceira do descaso. A sustentabilidade não está nas aparências. Ela não é balizada por frágeis mudanças sem conteúdo maciço, sem a pretensão de uma metamorfose. Ela não parte do nada e não chega a lugar nenhum. Ela não se inaugura com uma quadra de ciclovia, ela é uma estrada inteira. A água, quando cai no Dilúvio, faz o barulho característico dos riachos, aquele som que muitas vezes queremos levar para casa, comprando uma fonte de decoração. O barulho é tão bonito e característico, mas o concreto afasta a cidade da natureza, que suja de nossos resíduos, continua seu caminho. As margens do Dilúvio são uma síntese do que somos. Os carros, os excluídos, a sujeira, os “novos caminhos” e a natureza que teima e vive entre o cinza da ambição humana. O Dilúvio é o símbolo de uma sociedade precária, individualista e agressiva. Como muitas das crianças que moram embaixo de suas pontes, suas águas são agredidas desde o começo de sua vida. Já em sua nascente, na Lomba do Sabão, o arroio é violentado pela ocupação irregular da área. Famílias, sem condições de moradia, ocupam um local protegido por lei, e jogam seus dejetos nas águas do Dilúvio. Pessoas violentadas pela sociedade do ter, sem espaço para tentar ser, violentam também o arroio e invadem seu espaço. Espaço que cada vez existe menos. Espaço cada vez mais ocupado pelo lixo, espaço que nós não temos mais. O espaço que poderia ser de lazer, de contato com a natureza em meio à cidade, torna-se um espaço do qual fugimos. Não a toa, algumas pessoas defendem que se cubra o Dilúvio. Defendem uma grande tampa de concreto, que não cure a ferida, mas nos impeça de ver ou sentir. Mas incrivelmente, violentado do começo ao fim, o Dilúvio segue vivo, suas águas, são a moradia de peixes, pescados por improváveis gaivotas porto-alegrenses. E suas margens, costeadas pelo cinza, ainda conservam um verde, que insiste em se manter vivo. * Publicado originalmente no site EcoAgência. Os serviços comunitários de água, que atendem cerca de 2.500 localidades rurais do México, são uma realidade que reclama reconhecimento legal. Cidade do México, México, 17 de dezembro de 2012 (Terramérica).- Os sistemas comunitários de abastecimento de água, que funcionam em milhares de localidades do México, querem que uma nova estrutura legal federal em estudo os reconheça como gestores do precioso recurso. “Estamos em um limbo jurídico, porque a lei não nos reconhece, e, ao mesmo tempo, exige que peçamos concessões e façamos investimentos”, disse ao Terramérica um integrante do Sistema de Água Potável de Tecámac, Ricardo Ovando. Esta entidade sem fins lucrativos e autônoma funciona desde a década de 1950 e foi legalizada em 1997; administra seis poços e abastece cerca de quatro mil usuários em Tecámac, município de 365 mil habitantes no Estado do México, 40 quilômetros ao norte da capital federal. O Sistema de Água Potável de Tecámac já conhece as perseguições, pois em 2005 o governo municipal tomou suas instalações, que foram recuperadas graças a um amparo legal em 2007. Há 2.517 órgãos operadores de água deste tipo, que atendem a 2.454 cabeceiras municipais sob a forma de sistemas autônomos ou de juntas ou comitês rurais, estima o não governamental Grupo de Estudos Ambientais. O restante das quase 198 mil localidades rurais mexicanas são abastecidas por sistemas estaduais ou municipais, ou por concessionárias. Mas neste país de quase 117 milhões de habitantes, 30% das moradias não têm água encanada e outros 15% a recebem a cada três dias por outros meios, segundo estatísticas oficiais. A Lei de Águas Nacionais, de 1992, não reconhece juridicamente os sistemas comunitários que, no entanto, funcionam graças aos conselhos de bacia, figura criada para a interação entre a governamental Comissão Nacional da Água e delegados dos usuários e de autoridades federais, estaduais e municipais. “As comunidades cuidam dos recursos naturais e devem decidir o que fazer com eles”, disse ao Terramérica Esteban Solano, morador na localidade de San Pedro Atlapulco, no município de Ocoyoacac, Estado do México, uma zona pródiga em riqueza florestal e hídrica. Essa população se abastece de três dos quatro mananciais que brotam das montanhas e que também permitem bombear 22 mil metros cúbicos de água por dia para a Cidade do México. Em compensação, o governo da capital entregou cerca de US$ 4 milhões desde 2006. A Constituição mexicana já reconhece o acesso à água como um direito humano básico, estabelecido em 2010 pela Organização das Nações Unidas (ONU), que lhe deu natureza vinculante. Contudo, o Congresso nacional deve aprovar uma nova lei para incorporar essa mudança e tem prazo até fevereiro para fazer isso. O novo governo, que tomou posse no dia 1º deste mês, prepara seu projeto, do qual poucos detalhes são conhecidos. Entretanto, o presidente Enrique Peña Nieto anunciou durante sua campanha eleitoral um pacote de 38 medidas para garantir o abastecimento universal, incluindo construção de represas, aquedutos e estações de tratamento, além da criação do Ministério da Água. Além disso, o novo governo deve apresentar nos próximos meses um Programa Nacional Hídrico até 2018. É necessário revisar de maneira “crítica e sistemática as concessões, atribuições e permissões que garantam a participação das comunidades locais e dos afetados”, disse ao Terramérica o presidente da Academia Mexicana de Direito Ambiental, Rolando Cañas. Por seu lado, as comunidades que administram seus recursos hídricos e outras organizações não governamentais preparam uma proposta para a futura lei de águas. Entre outros elementos, propõe reconhecer os sistemas de autogestão, a cogestão comunitária-municipal, a criação de programas locais de água potável e saneamento, os acordos entre vários municípios, e a supervisão comunitária do projeto, construção, operação e manutenção das estações de tratamento de esgoto. “A lei deve estar baseada em uma perspectiva de direitos humanos. Vamos em direção a um modelo muito ambicioso, temos que garantir um bem público. E precisamos pensar além da gestão de bacias, porque cada usuário defende seu uso da água”, disse ao Terramérica a pesquisadora Raquel Gutiérrez Nájera, da Universidade de Guadalajara, no Estado de Jalisco. A água é abundante do centro para o sul do território mexicano, mas escasseia na região norte, que sofreu este ano uma intensa seca, fenômeno que será mais frequente devido à mudança climática, segundo os cientistas. Blindar a administração hídrica comunitária é um passo para frear a privatização que ameaça o futuro marco legal, afirmam alguns. The notion that one can feel deeply, passionately about a particular issue – and not do anything in practically about it – seems to have flummoxed the broader environmental community. Why else would we continue to design surveys and polls gauging public opinions about climate change (or other serious ecological threats)? Such surveys – even high profile, well funded mass surveys – continue to reproduce pernicious myths regarding both human subjectivity and the so-called gaps between values and actions. It is no surprise that data surfacing in a survey or poll will stand in stark contrast to the ‘down and dirty’ world of actions. We all know that surveys invoke all sorts of complicated things like wanting to sound smart/good/moral, one’s own self-concept vs. actual feelings or thoughts, and being corralled into highly simplistic renderings of what are hugely complex topics or issues (“do you worry about climate change/support carbon tax/drive to work each day etc?”). So there is the obvious limitation right now. However, more important is this idea that the thoughts or ideas people hold will translate into their daily life. Reflect for a moment on an issue you care very deeply about. Now consider how much in alignment your practices are, in relation with this issue. It takes seconds to see that in fact, we can have multiple and competing desires and commitments, quite easily. So why is it so hard for us to carry this over into how we research environmental values, perceptions or beliefs? If we accept from the get-go that we are complicated beings living in hugely complicated contexts, woven into networks extending far beyond our immediate grasp, it makes a lot of sense that I can care deeply for my children’s future quality of life (and climatic conditions), and still carry on business as usual. I may experience deep conflict, guilt, shame and pain, which I can shove to the edges of consciousness. I may manage to not even think about these issues, or create nifty rationalizations for my consumptive behaviors. However, this does not mean I don’t care, have deep concern, and even profound anxieties. Until we realize this basic fact – that we are multiple selves in social contexts, and dynamic and fluid – our communications work will be limited. Why? Because we continue to speak with audiences, design messaging, and carry out research with the mythical unitary self in mind. We try to trick, cajole, seduce people into caring about our ecological treasures. This is simply the wrong track. Rather than trick, why not invite? Rather than overcome ‘barriers,’ why not presume dilemmas, and set out to understand them? There is also the fact that some knowledge is just too difficult to bear. The concept of “difficult knowledge” relates to the fact that when we learn, we also let go of cherished beliefs or concepts, and this can be often quite painful. How we handle knowledge, in other words, can and should be done with this recognition. How can we best support one another to bear difficult knowledge? One of the tricks of the trade for gifted psychotherapists is the ability to listen and converse. The therapist listens; not only for the meaning, but where there may be resistance. The places that make us squirm or laugh nervously or change the topic. This is regarded as where the riches lie – where we may find ourselves stuck despite our best intentions. If we were to practice a bit of this in our own work in environmental communications, my guess is we’d see less rah-rah cheerleading engagement styles, and more ‘let’s be real and get down to business’ sort of work. And this is what we need, desperately. Dec. 17, 2012 — As a new year approaches, the University of Notre Dame’s John J. Reilly Center for Science, Technology and Values has announced its inaugural list of emerging ethical dilemmas and policy issues in science and technology for 2013. Dec. 17, 2012 — Physicians should not prescribe cognitive enhancers to healthy individuals, states a report being published today in the Canadian Medical Association Journal (CMAJ). Dr. Eric Racine and his research team at the IRCM, the study’s authors, provide their recommendation based on the professional integrity of physicians, the drugs’ uncertain benefits and harms, and limited health care resources. Prescription stimulants and other neuropharmaceuticals, generally prescribed to treat attention deficit disorder (ADD), are often used by healthy people to enhance concentration, memory, alertness and mood, a phenomenon described as cognitive enhancement. The prevalence of cognitive enhancers used by students on university campuses ranges from 1 per cent to 11 per cent. Taking such stimulants is associated with risks of dependence, cardiovascular problems, and psychosis. Éric Racine’s research is funded through a New Investigator Award from the Canadian Institutes for Health Research (CIHR). The report’s co-author is Dr. Serge Gauthier from the McGill Centre for Studies in Aging. It’s a pretty precious resource, considering that we need it to live. But do we actually care enough to change our behavior to make sure we have it in the future? The aging water infrastructure in the U.S. is fragile, to say the least; every year, over 1.7 trillion gallons of water are lost due to leaks and breaks in the system. It’s never good to waste water, but that’s a staggeringly unacceptable figure at a time when the country is facing unprecedented droughts. But on a grassroots level, things may be starting to change. Water technology company Xylem’s new Value of Water Index, which examines American attitudes toward water, indicates that the public is finally realizing the magnitude of our water problem–and that everyone might need to pitch in to fix it. According to the report–culled from a survey of 1,008 voters in the U.S.–79% of Americans realize we have a water scarcity problem. That may seem high, but 86% of respondents also say they have dealt with water shortages and contamination, meaning it takes a lot (or is just impossible) to convince some people. 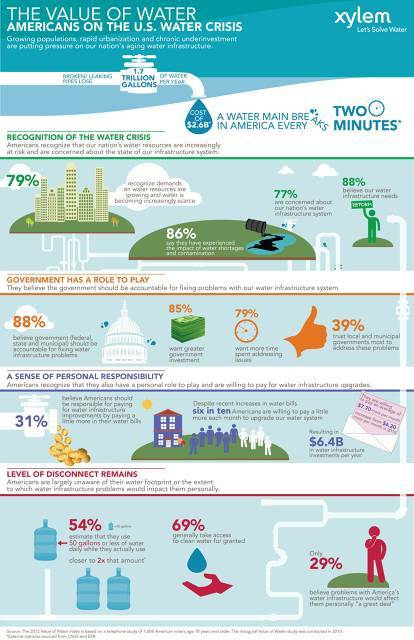 A whopping 88% of respondents think the country’s water structure needs reform. The problem is, while 85% of people want more government investment, no one is quite sure whether big or small government can best handle the problem: 39% of respondents trust local and municipal governments, 27% want help from state governments, and 22% think the federal government should help out. Realistically, it is probably the local and state governments that will do the most. Around the world, cities are taking the lead on smart water management. Americans also think they have some personal responsibility for the crisis–specifically, 31% of respondents think they should have to pay a bit more on water bills for infrastructure improvements. If Americans upped their monthly water bill by just $7.70, we would see an extra $6.4 billion for water infrastructure investments. In spite of everything, 69% of those polled say they take clean water for granted, and just 29% think problems with our water infrastructure will seriously affect them (remember: the vast majority of respondents have dealt with water shortages and contamination already). Water awareness still has a long way to go–but it will most likely be sped up as water shortages become more common.